The Quavers logo sits neatly in a fluffy white cloud and there are three random Quaver images floating beneath it, but that’s it. It also says the bag has 88 calories worth of snacks inside, but it doesn't mention the weight for you to compare it to other allegedly light snacks. We have no axe to grind and would prefer to provide positive feedback, or at least constructive critique, but in this case it is not possible. Crispy snappy crash, then pulp. It really is that quick. There is nothing remotely similarl to a Potato Chip or Crisp crunch. There may be some Potato involved in this snack, but it doesn’t say there is on the ingredients list. It says ‘Potato Starch’ but nowhere does it say Potato. So, to describe these snacks are to describe nuts or Twiglets. The snacks are all uniform curls and have rugged undulated surfaces with lots of perforations and holes. They are yellow in colour. 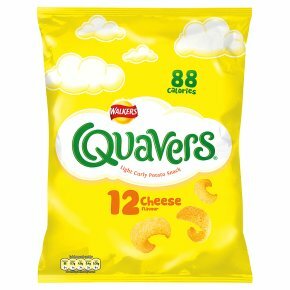 First the formalities: We have not found a snack bag on the Chips and Crisps aisle with fewer calories than Quavers. However, this may or may not be misleading – the multipack bag we tested does not declare the weight content of the bag. As the 88 calorie thing is the main marketing gambit of this snack, this is either an anomaly or a very deliberate ploy by Walkers. We will not get involved in this. And so on to the flavour... Cheesy and satisfying; and still one of the leaders of its low calorie class.